Chinese drugs and pharmaceutical ingredients are found in medicine cabinets as far away as New York and Chicago, and the country’s exports of pharmaceutical products and health supplements worldwide jumped 3 percent to $56 billion last year. Yet even as China’s drug industry has grown in global stature, so have questions about the safety of its products. Consider: Last year, about 700 Chinese firms were told by regulators in China to review their pending applications to sell new drugs and voluntarily withdraw any that were false or incomplete. Within months, about 75 percent had been retracted by the manufacturers or rejected by Chinese officials. Among those were some medicines that were separately approved for sale in the U.S. by the Food and Drug Administration. Some of the companies say their data in China were flawed because of faulty information by local research firms, and their applications for the U.S. usually include tests done by research firms in North America — indicating those drugs should be safe. Chinese pharma exports to the U.S. rose 4 percent last year. The withdrawn applications in China show both the country’s progress and the scale of its task in cleaning up its sprawling pharmaceutical industry, which for years has been plagued by instances of substandard generics. At home, the government is seeking to elevate the standards of locally made medicines to curtail the use of expensive foreign-made drugs. 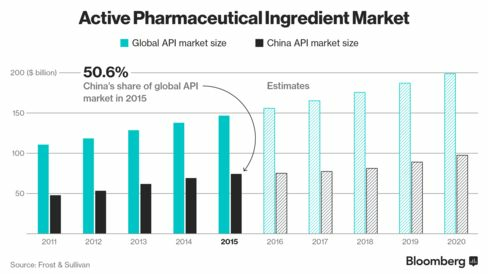 At the same time, Chinese conglomerates with deep pockets are racing to ramp up quality to international levels to grab a bigger slice of the U.S. pharmaceutical market. “Drugs approved in the past are still being used, but there may not be accurate data to prove that their efficacy reached international levels,” Wu Zhen, vice minister of the China Food and Drug Administration, said at a press conference last year, referring to locally made medicines sold in China. The China FDA didn’t respond to faxes seeking comment. China now has nearly 5,000 drug factories supplying the domestic market and more than 500 facilities registered to sell to the U.S. But its companies are struggling to gain the trust of patients, doctors and regulators — both overseas and at home. In one local incident in December, Chinese regulators swooped down unannounced on the warehouses of a generic drugmaker called Hainan Yier Pharmaceutical Co. in the southern province of Hainan. Samples were taken and tests done. The results? Three batches of pharmaceutical ingredients intended for anti-depressant tablets didn’t meet quality standards, and were only a kind of starch, according to an inspection report posted on the Chinese regulator’s website. Some of the drugmaker’s pills also contained poor quality ingredients, according the report. The regulator in a February statement said it was banning two ingredients and an anti-depressant made by the company. In a statement posted on its website in February, Hainan Yier said that it had recalled 40,537 boxes of the drug from the Chinese market. The Chinese agency didn’t at the time list problems with any of the company’s other medicines, and it is still licensed to sell products including blood-pressure treatments, pills for migraines, and tablets for tuberculosis in China. Its website doesn’t report any sales of drugs outside China. The company did not respond to calls and e-mails seeking comments. The Chinese generics industry’s image problems go back several decades. In the 1960s, during Mao Zedong’s Cultural Revolution, there was a proliferation of factories manufacturing pharmaceuticals — but no unified drug regulator to ensure the quality of the chemicals, said Yanzhong Huang, a senior fellow of global health at the Council on Foreign Relations. Later, under the reign of Zheng Xiaoyu, China’s top drug regulator from 1994 to 2005, tens of thousands of drug approvals were doled out, often based on loose standards and sometimes in exchange for bribes to officials, according to the Chinese government. Zheng was executed in 2007 for corruption after he was convicted of accepting bribes and allowing some drugmakers to receive approvals based on fraudulent materials. The approvals issued during Zheng’s rule, however, could not be retracted and the medicines remain on the market in the country. Even some retired government officials (a powerful force in China) have complained when generics for ailments like blood pressure haven’t worked, said Li Weiping, a drug registration expert who has worked in China for decades. Under pressure to clean up the system, the China FDA has ramped up controls and its demand last year that pharma companies review their data was part of these efforts. The agency has in recent years openly acknowledged a certain “distance” between the quality of foreign drugs and some of their local generic versions, especially those approved before the revamp. Chinese exports accounted for 19 percent of the global raw drug ingredient market last year, according to Neil Wang, Greater China president at consultancy Frost & Sullivan. Chinese companies have become more ambitious and are attempting to sell more finished pills around the world. As part of the regulatory overhaul last year, Zhejiang Huahai Pharmaceutical Co., one of the country’s biggest exporters of pharmaceuticals, withdrew its Chinese applications for generics for epilepsy, blood pressure and depression because of flaws in its clinical trials for China. Those generics have been approved in the U.S.
Huahai said in an e-mail that it performed trials for applications at home according to domestic regulations and the company attaches “great importance” to quality. The problems with the Chinese drug applications relate to flawed testing by a local Chinese contract research organization, affiliated with a major hospital in China, said Jun Du, chief executive officer of the company’s New Jersey-based U.S. unit. It was only used for the local drug applications, not foreign approvals. By contrast, all the testing for Huahai’s U.S. drugs was done at FDA-inspected sites by reputable contract research organizations usually based in the U.S. and Canada, he said. They were unaffected by the problems with the testing sites inside China, he said, adding that the parent company is in the process of re-submitting the applications for the withdrawn drugs in China, using the higher quality U.S. data. Huahai did not name the CROs it used for the withdrawn applications. Guangzhou Boji Medical & Biotechnological Co. was named in a statement by the China FDA as the contract research organization responsible for one Huahai application rejected for flawed data. In e-mailed comments, Boji said that it was not involved in Huahai’s other applications that were withdrawn, and did its duty in supervising the testing. Clinical trials are a complex project involving many players, and “when problems occur, all parties should face them squarely and correct them promptly, instead of putting the blame on one party,” Boji said. Another company, China Resources Saike Pharmaceutical Co., in December also pulled an application to sell an epilepsy medicine called levetiracetam in China, acknowledging that clinical trial data submitted with that application were flawed. Two weeks later, the same drug was approved for sale in the U.S.
Saike said the U.S. FDA waived a requirement to do human trials on the medicine and that other materials it submitted met the agency’s requirements for generic drug approvals. It didn’t respond to questions on where its tests were done. About 80 overseas companies, including some from India and South Korea, were also involved in the data overhaul in China last year and some of them also had to withdraw their drug applications. U.S. FDA approved generics have met the same rigid standards as the innovator drug, the agency said via e-mail. Application reviews and facility inspections are conducted with the same rigor independent of the manufacturer’s geographic location, it said, adding that trained specialists conduct the inspections and analyze product samples. Poor quality pharmaceutical ingredients have in the past made their way around the world, with deadly effects. In 2008, when a blood thinner, called heparin, was made with contaminated Chinese ingredients, 246 deaths in the U.S. were linked to the medicine. More recently the U.S. FDA has said that several large Chinese drug exporters falsified test records in their factories. Earlier this year, Zhejiang Medicine Co., a Chinese manufacturer of antibiotics sold in the U.S., received a warning letter from the U.S. FDA which alleged it hid quality testing results that may have indicated product contamination. The company in a stock exchange statement said it will rectify and reform practices at the site and will meet the U.S. regulator’s compliance deadline. Meanwhile, in the southwestern Chinese province of Yunnan, a single mother and HIV patient, whose last name is Yang, says she often frets about a generic treatment called lamivudine that is meant to boost her immune system. After Yang contracted HIV through her husband in 2006, she took imported lamivudine for over a year and a key indicator of types of white blood cells in her body — called the CD4 cell count — jumped to 600 from 160. But by late 2007, a government drug subsidy program from which she received free medicines began to provide only locally made generic versions of the drug, and Yang, now 49 years old, says her levels have since dropped to as little as 400. “The medicines didn’t work as well as I had imagined.” said Yang. “Many of my friends with HIV had the same problem.” Yang’s husband has since died and paying for foreign brands out of pocket is impossible because she lives on a small sick-leave stipend. Each time she and her fellow patients got tested when taking the foreign brand their immune cell counts went up by at least 50, she said, but they saw no such increases when taking local generics. And eventually she found that the privilege to switch to the imported brand had vanished from the public-health program. Yang’s experiences with the HIV Chinese generics were corroborated by a worker for a non-profit group that works to educate Chinese patients with AIDS. While this person asked not to be identified, he said he and other HIV sufferers had similar reactions to Chinese generics. At a hospital on Beijing’s outskirts one senior cardiologist says his department is avoiding Chinese generics because some don’t work in precisely the way they are supposed to.